Ben Steere, PhD, Assistant Professor of Anthropology & Director of the Cherokee Studies Program at Western Carolina University. 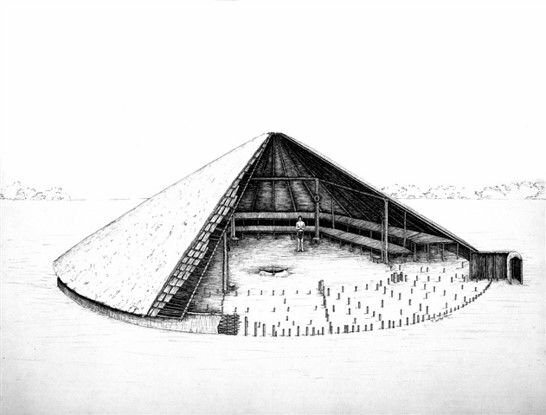 Drawing by Tom Whyte from Schroedl 1986, Overhill Cherokee Archaeology at Chota-Tanase. The archeology of mounds and towns in the Cherokee heartland of the western part of the state was the topic of a presentation given by Ben Steere, PhD, Assistant Professor of Anthropology & Director of the Cherokee Studies Program at Western Carolina University. The Western North Carolina Historical Association sponsored Dr. Steere’s presentation at the Reuter Center on the UNC Asheville campus. Steere said that archeology integrated with traditional Cherokee perspectives on the landscape and worldview gives us a much more nuanced and culturally appropriate understanding of the cultural landscape of western North Carolina, as opposed to that of archeology alone. Steere said he has found the traditional western education experience falsely implies some kind of break between history and prehistory. The standard scientific training in archeology he received in tandem with his experience working closely with the Eastern Band of Cherokee Indians has taught him in some very meaningful ways that archeological sites are not just things of the past. They documented dozens of Cherokee burials, none of which were excavated. Steele said the Cherokee believe the dead are to be left undisturbed. “Among other things, burials make the landscape safer, and they’re a way to claim space and identity. In traditional Cherokee burials, the people involved in the ceremony would have to go through a purification ceremony afterwards because death is powerful and dangerous.” In respecting those beliefs, none of the burials were excavated, but the hundred-plus structures were, and all features documented. Mississippian Period dwellingsin Cherokee communities were typically built around a centrally located public building for gathering, or townhouse, built on a mound. Earth and clay were brought to a central clearing, packed down, and the mound was formed. When it became necessary to replace a townhouse the old one was burned, and a new structure was erected on the footprint of the previous one adding to the mound’s elevation. As ceremonies repeated at the townhouse the accumulation of materials resulted in further development of the mound, so as time passed the mound would continue to grow in size. There is an archeological sequence to how mounds and towns changed over time in our region. “Monumental earthen architecture and communities evolved as social and economic conditions changed, but there is also a whole lot of continuity over common themes that unite Cherokee people today with their ancestors through landscaping architecture. Mound building is an ancient tradition. Some of the first are located in the lower Mississippi valley, and date back to as early as 6,000 B.C.,” Steere said. “From a traditional Cherokee perspective, mounds are thought to have a sacred central eternally burning fire. There is an actual physical fire at the bottom of mounds, and a spiritual fire that burns eternally. Townhouses from the 18th century each had a central fireplace, and every year there was a Green Corn Ceremony, the origin of today’s fall festivals,” Steere said. Individual homes would extinguish their home fires, and reignite them from the eternal flame in the mound beneath the townhouse. “Each home was thereby linked ceremonially by fire to that townhouse. In 1838 when some of the Cherokee were relocated in the Trail of Tears, they took coals from fire at the Kituwa mound and carried them all the way to Oklahoma. They relit their townhouse fire in Tahlequah, Oklahoma with coals from that fire. That’s the kind of religious and cultural power these places have,” Steere said. As early as 200 A.D. people were using Asheville as a central gathering place for important civic ceremonial events. There is a prehistoric Native American mound on the Biltmore Estate near the confluence of the French Broad and Swannanoa Rivers that dates back to the Woodland Period. In 2003 archeologists from Appalachian State University excavated one quarter of the mound. “What you see there are different layers of soil built up one atop the other, alternating colors of red and white clay.” Each time a round structure on the site was rebuilt they covered it in brightly colored clay. At the center of the mound at Biltmore they found a large posthole for a single post going up towards the sky, so the physical fire would have been off to the side. “In traditional southeastern Indian cosmology the belief held is that the world is divided into three parts. You have this world as a disk floating above water, the above world held up on four strings in the cardinal directions in the sky vault, and the below world associated with chaos and danger. That pole going through the mound may be a way to represent a conduit between the three worlds,” Steere said. The Woodland Period showed signs the population was becoming more sedentary. During the Mississippian Period we see major changes in the human settlement. After 900 A.D. people began planting corn, investing in maze agriculture. We see the construction of more permanent structures. Also during this period they began building the chief’s house on top of the mound, literally elevating the chief above other members of the tribe. The Nikwasi Indian Mound in Franklin, North Carolina is a good example of this, and still remains an important part of the landscape. “If you look at the spacing of these large platform mounds in western North Carolina it’s interesting to note that these mounds are distributed pretty evenly along the landscape and follow the track of current county seats. Steere estimates the Nikwasi Mound to be at least 500 years old, and remains relevant today. Today it is surrounded by between five and 15 feet of fill dirt, but much of the associated village, though now buried, is still intact. “In a way this Cherokee village is still there,” Steere said.